Two days after my 55th birthday I boarded a plane bound for France. 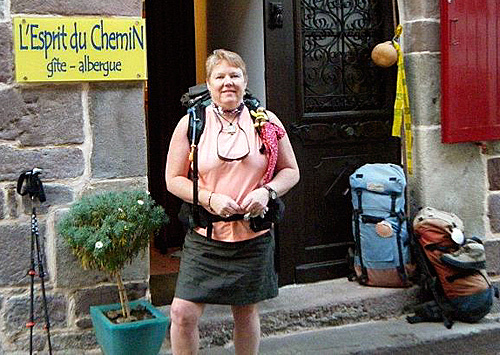 I was headed to Europe my first international backpacking adventure. After 3 plane and 2 train rides my partner and I arrived in St. Jean Pied du Port, France. 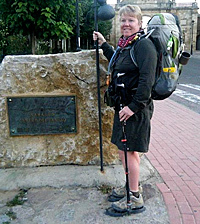 This is the starting point for the Camino de Santiago, the Way of St. James. After a day of rest, we headed west up into the Pyrenees. Today was in my mine nothing short of a miracle. The Camino is a very spiritual hike for most people. I really wasn't here to atone for anything in particular, nor was I here to work through problems in my life. I was here to hike, for me that was my issue. Most of my hikes the past few years have ended early due to knee issues, which means pain. Now, here I was on a 500 mile adventure with two brand new knees. I had gone through with total knee replacement surgeries just a few months back. On the Camino you hike from town to town, church to church. I said a prayer in every church that my knees would stay strong and carry me all the way to the end. My partner and I made it up and over the Pyrenees and crossed the border into Spain. Here I was expecting to sleep in a dorm room with 120 other Pilgrims. 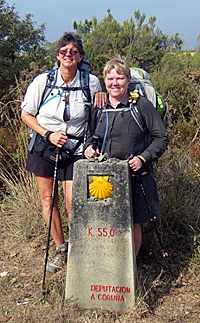 (The Camino hikers are referred to as Pilgrims.) You can imagine what kind of noises would transpires in a room like that at night. Luckily, we were surprised with a brand new facility that had nice little cubicles of 4. Technically, the open cubicles still let the noises flow but helped to buffer it some. I became very attached to my purple earplugs. As with all hikes the hikers become friends very quickly. We seemed to hike together or at least end at the same place each night. I enjoyed my trail family immensely. It consisted of a man from Denmark, a lady from Holland, a lady from South Africa, a couple of English ladies and two ladies from New Zealand.This is a very international trail. It is located in Spain but the Pilgrims are from all over the world. Unfortunately, I speak English and have never followed through with the education of a second language. Luckily, most of the other Pilgrims spoke two or three other languages and were very helpful. My days consisted of hiking up and down the mountains, through farmlands and vineyards. A number of times each day the trail would take you through a small town, village or hamlet. Most had at least one cafe/bar. In the morning that meant cafe con leche (coffee with milk) for most and a tea for me. Chocolate croissants and potato tortillas were always a treat for breakfast. The main breakfast served at the alburgues (hostels) is bread, butter & jam. That gets old very fast. If it was later in the day the cafe/bar would be the spot for wine or cerveza limon (a mix of beer and lemon soda). I preferred just the lemon soda. Lunch would be a bogadilla (sub). It consisted of 2-3 thin slices of meat, a slice of cheese and tomato upon request. No condiments, just dry bread. I ate plenty of them, a hiker has got to eat. Our daily routine was walking, securing a bed in an alburgue (hostel), showering, doing laundry, and finally relaxing a little before going to the Pilgrim dinner. There were usually 2 or more alburgues in town, the more desirable ones filled up first. It was not unusual to find a "Completo" sign on the door if you came in late in the day. Then you either had to hope your second choice still had beds available. If not you may find yourself back out on the trail moving on to the next town in hopes of an available bed. Luckily we were hiking near the end of the season and only had to move on a couple of times. Not to mention we hiked shorter mileage days, so we got to the alburgues early in the day. Most of the alburgues had multiple rooms with a number of bunk beds in each room, anywhere from 4 to 10. There were a few that had one large room full of bunks. I remember staying in one where the bunks were only about 18 inches apart. We referred to it as the sardine can. The Pilgrim dinner was either included in your bed rate or you would go to a cafe/bar in town. I found that the alburgues that cooked had the best food. The cafe/bars all seemed to serve the same meals over and over. First plate, was salad or soup. Second plate was fish with fries, pork with fries, beef with fries, occasionally there was a rice dish called paella. Dessert was yogurt, ice cream, flan or rice pudding. I really liked the rice pudding. One of the hardest things for me to get use to was the dinner hour. Pilgrim meals were served at 7:30 PM. If you wanted something from the main menu you had to wait until 9:00 PM. I wake at 5 AM and having hiked all day I was hungry and tired. That really seemed late to me. Not to mention when I would eat that late and go to bed, my sleep was never deep as my stomach churned. Unfortunately, unless I cooked my own dinners it was unavoidable. About midway into the hike we came to the Meseta, a very flat region without much in the way of scenery to look at. Well at least in late fall, all the farms had been harvested. The flat, repetitious walking seemed to have many of the hikers, my partner included suffering from tendinitis. I was lucky not to be bothered and I was thrilled that the knees were holding up well. We did stop in a few of the bigger cities along the way, Pamplona, Burgos, and Leon. Each had large ornate cathedrals. It took hours to tour the one in Burgos. Even the small little churches in the towns along the trail had ornate golden alters. As we got further west on the trail the food began to change, there was more regional specialities. Fried eggs began to show up in the cafe/bars for breakfast. There was a cabbage soup that seemed to be a Pilgrim favorite. A white bean stew was on my list of likes. As we got closer to Santiago, pulpo (octopus) was very popular. While I was happy with more choices, it was still late... I did manage to cook at two alburgues that had kitchens. One night I made a vegetable spaghetti, and the other time it was a white bean stew. As we got closer to the end of our hike we had temperature changes. The days were still pleasant but the mornings and nights became pretty cold. I also could see that the Pilgrims were picking up there pace and hiking more miles each day. As my partner put it, they were being drawn into the Santiago vortex. We actually slowed down a bit in no hurry to end our journey. Finally my knees carried me into the city of Santiago and my journey was over. 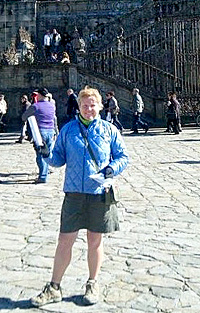 I had hiked 500 miles along the Camino de Santiago, through small Spanish villages and large cities. I went to the Pilgrim's office and obtained my Compostella (certificate of completion) and then attended a mass for the Pilgrims in the cathedral. We did not have the time to hike for another 3 days to go to Finisterre, so we went by bus. Finisterre is known as the end of the earth. It was believed when the ships sailed from here and were no longer visible on the horizon, that they had fallen of the flat edge of the earth. Until Columbus came back and said the world was round. This was a wonderful adventure. The hike was full of hikers from around the world, and varied in ages (although I will say there were more over 50 hikers), it was a great multi-cultural hike for me. I may not repeat this hike as there are many other Caminos in Europe. A number of them are already on my to-do-list.